I don't like trendy restaurants. You won't see me at the launch for the latest hip and happening place unless it's an accident; for example I once walked off the streets into the Wolseley when it first opened. I probably couldn't get a reservation now, but for what it's worth I rather liked it. But when I'm abroad, I often find myself homing in on places that are "cool", because those are the places that come onto my radar - certainly whenever I ask for a recommendation, nine times out of ten someone will suggest a fashionable hotspot. However, it's thanks to some local friends personally taking us that the husband and I find ourselves going to Girl and the Goat which has just that week graced the cover of Time Out Chicago. I have to admit I feel a certain frisson at being on the cutting edge for once, but this thrill is clouded rather by the concern that a certain Nathan Barley-esque Chicago-dweller who I have no desire to bump into might also be there. 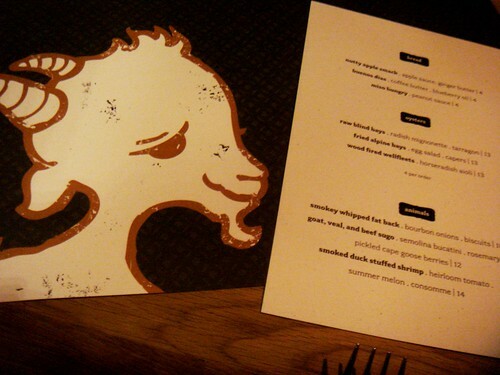 The male friend A is aghast to hear that neither the hubby and I are very keen on goat's cheese, as he's under the impression that the venue's name denotes a goaty theme, but the female friend J quickly sets us straight - the West Loop restaurant in fact focuses more generally on Mediterranean flavors and local ingredients. 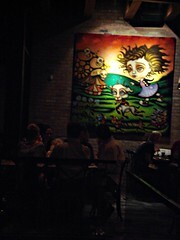 The chef is "Top Chef" Season 4 winner Stephanie Izard, which makes the place even more media-friendly. We arrive for our reservation to be told that despite booking we have to wait for our table. So we stand in the entrance as there's nowhere else to go - there's a lounge area to the left but it's already full of impatient looking people. Such is the price of popularity / TV fame. This place is LOUD and "funky", but after 15 minutes, it's thankfully time for us to sit down - and we move a metre diagonally to a table next to the front of house's desk. The waitress tells us that three dishes each is a good idea as they're "sharing plates". 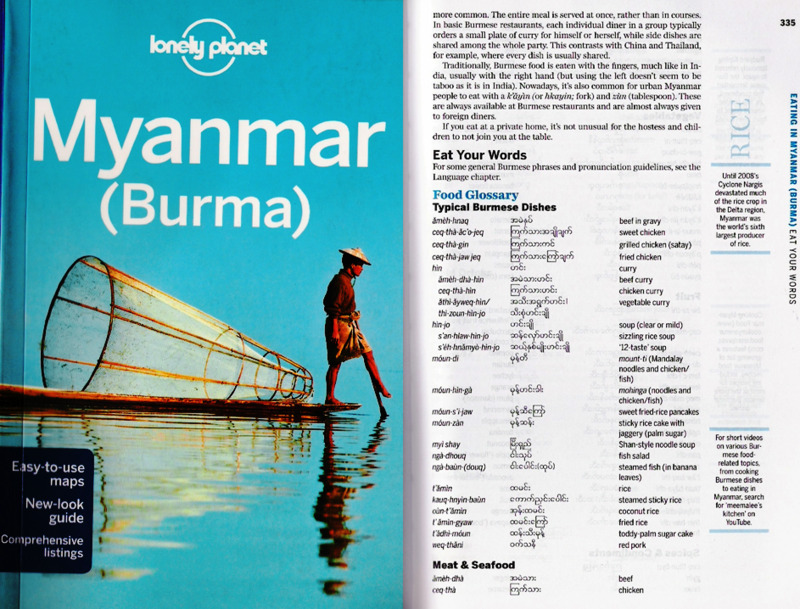 The menu is pretty irresistible, so this carte blanche to order with abandon is brilliant. Our menfolk are nerds - out comes an iPhone to make a list of exactly what we want - no duplications so we can cover all bases. The waitress takes drinks orders and then asks us to whip out our IDs which I find hilarious and slightly inappropriate. 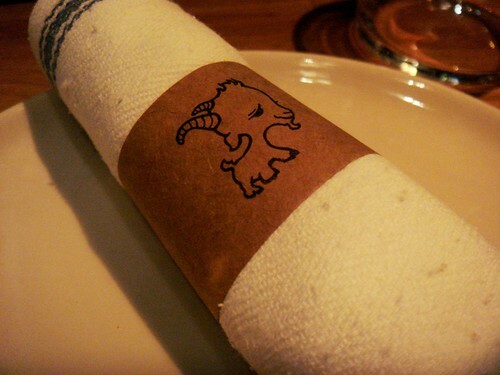 While we wait for our drinks, I coo over the goaty paraphernalia - the adorable logo is emblazoned on everything. The glassware is similarly desirable - J's wine comes in the cutest carafe. The boy's beers arrive - A's is twice the price of my husband's for no obvious gustatory reason. I've ordered a cocktail called the Pirate Norman, mainly because it sounds a bit like the Dread Pirate Roberts. The waitress then goes AWOL whilst we sip our drinks slowly to eke them out. Finally she returns to take our order and says, "That's too much" with a stony face. She retracts her statement that three dishes each is appropriate, claiming she meant three per couple. Rats. After a short and slightly heated confab, we manage to whittle down our choices. Bread comes swiftly - we've asked for the special of "Nutty Apple Smack" (how could we not?). It's the best bread I've ever had - warm, slightly crusty and studded with generous nubbins of pistachio. The dips of apple sauce and mayo are just gilding the lily. First proper dishes arrive - shaved kohlrabi salad, fennel, blueberries, Evalon (a raw goat's milk cheese from Wisconsin's Saxon Homestead Creamery), toasted sliced almonds. This is refreshing with lively textures - and the Evalon is actually pretty good. 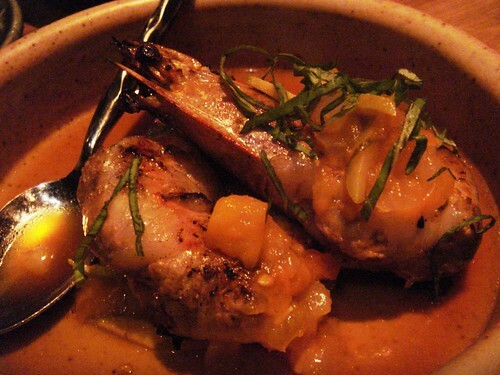 The "animal" special is smoked duck-stuffed shrimp. There's just two of the beasts and they're kinda dainty. They're tasty, but not half as good as the waitress made them out to be - she really sold us that specials menu. Another "animal" special arrives of smokey whipped fat back, Bourbon onions and biscuits. 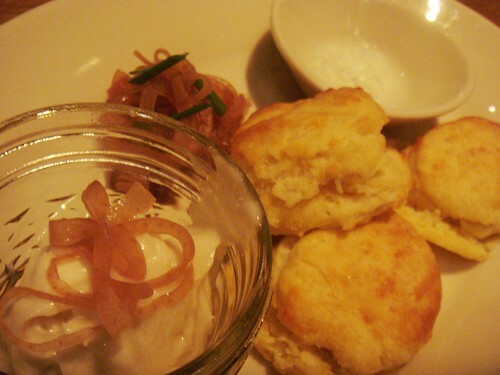 It's exactly what it sounds like - smokey pork fat whipped to a creamy texture - and much too greasy for me, even when schmeared over the wonderfully flakey biscuits (the American kind) and eaten with pickled onion slivers. 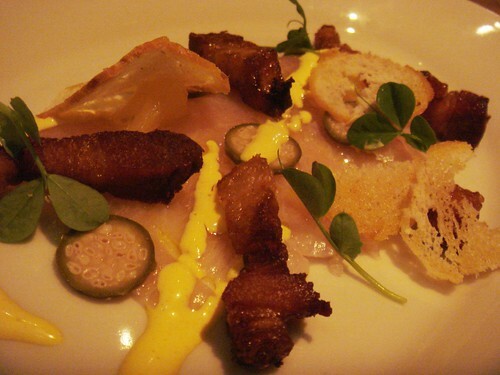 Next up is hiramasa crudo, crisp pork belly, aji aioli and caperberries. I really, really like this dish - the combo of sashimi and sweet, crispy pork is wonderful. But there's not nearly enough of it for my liking. Damn this sharing plates system. Damn it to hell. 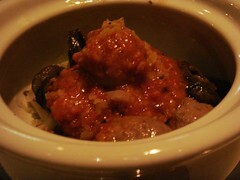 Next is escargot & goatballs, romesco, bagna cauda, almonds. Sadly not caprine naughty bits, but dense meatballs - well-made and well-flavoured, though the accompanying snails are rubbery. I can't really taste the romesco either - at least nothing that resembles the gloriously smokey stuff I've been taught to make. We're really excited about the next dish. 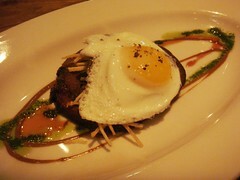 It's billed as pork liver mousseline, ham hock jus, apple mustarda and crumpets. Crumpets! The rest of it is sound - a smooth, meaty mousse, a feisty take on picallili. The next dish is the one I've been looking forward to the most, described as wood oven-roasted pig face, sunny side egg, tamarind, cilantro, potato stix [sic]. Awful spelling apart, I can't wait to add to my roster of animal's faces I have eaten, so I'm sorely disappointed to receive a slice of underpowered brawn. The wood-fired wiley point oysters with horseradish aioli are even more disappointing - neither hot, nor cold, but creepily lukewarm, suddenly I get why some people liken oysters to snot. You may have noticed that that's eight dishes so far - the waitress was wrong - six clearly isn't enough, so we order a few more. The next couple of dishes are magnificent as far as I'm concerned. Seared scallops, braised veal, caponata and marcona almond butter provides enormous, tender, juicy scallops (I think they're just big over here) - and the dish as a whole is well-composed. Our friends think the seasoning for the grilled baby octopus, guanciale and lemon-pistachio vinaigrette is too heavy-handed, but I'm lapping up the umami and trying not to purr. Our last dish is ham frites with smoked tomato aioli and smoked swiss cheese sauce. Apparently Izard dehydrates ham, pulverizes it and then tosses it with salt to season these crispy fries. Our friend A sums them up perfectly when he dubs them "the dessert-killers". 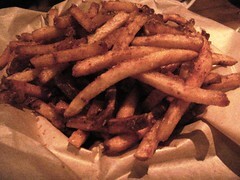 The fries are just too salty, too savoury, too intense for anything else to pass our lips. Mind you, the puddings don't sound too appealing anyway - sweetcorn nougat? Candied eggplant? Dragon's milk? 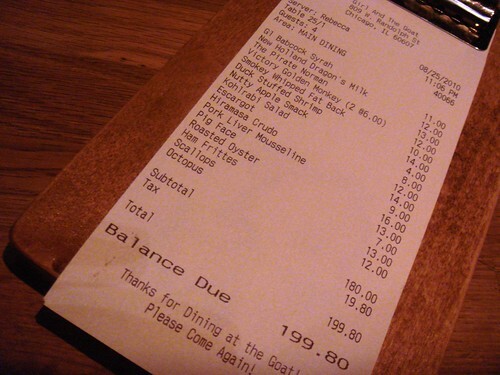 So we call it a day and finally ask for the bill, and when it comes we're pleasantly surprised. Partly because it's fairly reasonable, partly because it's by the far the funniest list of items we've ever seen. 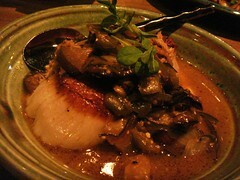 Girl and the Goat - slightly silly name, slightly silly place, slightly silly food. But I liked it, you know, and it's definitely a keeper. Christ, the waitress sounds like a piece of work though! @Sarah - Thought you might approve - and see - I might be won round to goat's cheese yet! @Sasa - I kinda liked her bolshiness. Ooh, this place looks fab. I really wanted to go here when I was in town but never got round to it. Shame on me. It looks quite similar to the Publican which is two blocks away and also very good. Another brilliant post, MiMi... the money shot for me, for once, was the opening napkin/serviette (depending on which side of which bit of water you are); beautiful photo and one which I'd be more than happy to have in A3 framed in my dining alcove - any chance of the untouched digishot? Serious-o, as the colours would be brilliant also. The resto sounds great apart from the waitress, who is obviously not after getting repeat business! Oh dear, just been to Girl and the Goat's website. Not a good plan to refer to your website like a daughter "She was born ... she blends her own wine" - blimey, it's one short of a horror story script where the resto eats the punters! Definitely the best reciept I've seen in a while! Shame about the Pig Face, bit of a let down really. 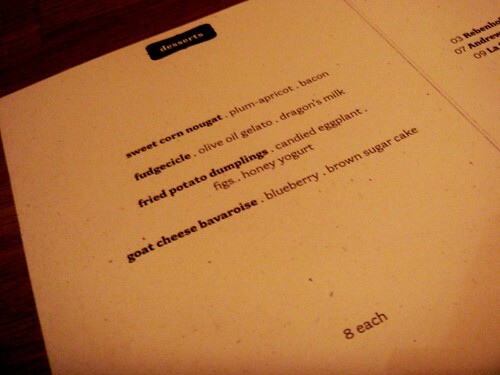 @Nordic Nibbler - I kept hearing about the Publican - I think it may be owned by the same people. @Pavel - More faces will be eaten, I promise. 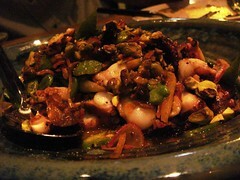 Excellent post and love the sound of the octopus. To echo many, more faces! 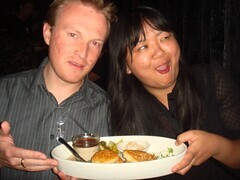 as a lover of tapas, I like the sharing plates thing, as it means I don't have to just pick one dish!! Trick is to pick stuff others not keen on too - naughty i know!! You're right about the bill, it's hilarious. I particularly like the sound of the nutty apple smack! Fifty bucks - that does seem pretty reasonable. Especially for face eating. Love the list of ingredients. 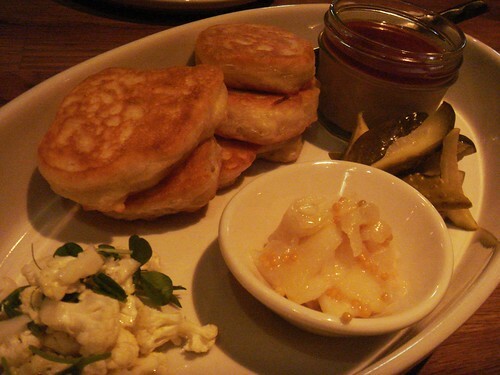 Those biscuits look very good - i like American biscuits just as much as English crumpets - pure breakfasty heaven. I think the service seems a little odd - particularly for the "welcome-i'm-your-server-big-grin" US of A. There's nothing i hate more than being told how mush i should eat. I mean, dammit, ii once managed a half a lamb shoulder all on my lonesome. It's always good to be directed. But never told. Incidentally, i wonder if the ID thing is a legal whatsit? When we went to Atlanta with my 22 year old cousin, we all got ID-ed (apologetically), even my 63 year old mum. And bravo with the face-eating. 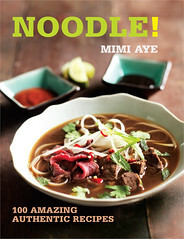 Maybe another blog beckons - www.faceeater.com? I would definitely have gone for Pig Face too-all looks a bit surreal!Very entertaining.